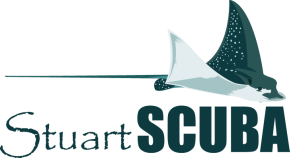 Stuart Scuba offers a multitude of specialty courses that you can take for specific interests or course requirements. Each course goes in depth on various subjects so that you can get the best information and training out of what interests you the most about scuba diving. We recommend a few regional courses for anyone that plans to dive in Florida, but a full list of all specality courses is available. Do you ever wish you could extend your no-decompression bottom times? You can continue your scuba education by taking the Enriched Air Nitrox (EANx) specialty course to obtain the knowledge and skills necessary to do so! Enriched Air Nitrox (or EANx, commonly referred to as Nitrox) refers to the practice of adding more oxygen to your air mixture, which offsets the amount of nitrogen you on-gas during a dive. Stuart Scuba will teach you the science behind this method and how to safely use EANx to extend your bottom times and shorten your surface intervals. Classes are academic based only and do not require diving for completion. Upon course completion, you will obtain a certification card that will allow you to fill your tanks, or rent tanks, with EANx. Most dive shops will require you to show this card, so keep it with your scuba certification card to show proof of EANx training. An expanded offering is available for those wishing to do a Nitrox dive with their instructor at the end of the course. The Fish Identification Specialty course provides you with the fish identification basics. So you’ll find you enjoy diving even more when you recognize the most of the fish, plants and some of the other creatures you see. The great part about this course is you can use the information you learn on every scuba diving adventure because once you learn the main fish families and characteristics it will help you recognize the different species you’ll see all over the world. The Drift Diver Specialty course introduces you to the most amazing ride in town. This course shows you how to enjoy and safely control your dive in water flows and ocean currents by quite literally “going with the flow,” staying with your dive buddy, communicating with the dive boat and knowing where. Most of the diving in Palm Beach County is drift diving, so why not learn from the experts? After you start gaining experience SCUBA diving as an Open Water Diver, you soon want to explore depths that are a bit deeper. There is always something exciting and mysterious about deep diving that attracts the attention of some divers. Scuba divers like to be neutrally buoyant. But it can be a complicated thing. Divers who’ve mastered Peak Performance Buoyancy really are performing at an elite level. You’ve seen them underwater. They move effortlessly, use less air change depths as if by thought. They have the ability to interact gently with aquatic life and affect their surroundings minimally. They do this through skill and by choice as opposed to by reaction. The Peak Performance Buoyancy course reviews basic skills learned in your Open Water Diver course and elevates them to a more perfected level. As the sun sets, you begin to slip in to your dive gear, put on your scuba mask and take a deep breath as you step off the boat or descend off the beach at the world famous Blue Heron Bridge into the underwater night. You've may have seen this reef many times before, this time it’s a whole new world and you watch it come to life under your dive light. Come explore the underwater world in a brand new light. You’ll be introduced to a whole new cast of animals that emerge after the sun goes down. You’ll see your favorite dive sites from a whole new perspective at night. We also offer an extensive list of specialty courses from each agency. Please contact the Stuart Scuba for details, pricing and scheduling.